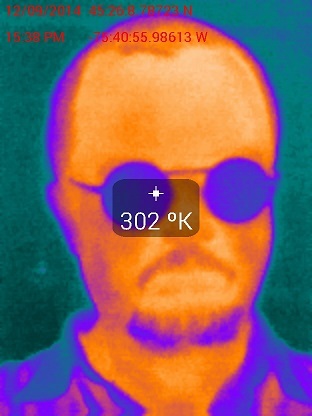 Today, I became a proud owner of a new smartphone attachment: a thermal camera. I long wanted to have a thermal camera, but the prices were frivolously high. One of the cheapest cameras from FLIR, for instance, the TG165, costs five hundred dollars and has a measly 80 x 60 pixel sensor resolution. FLIR has a smartphone thermal camera attachment that’s cheaper, but its resolution is also low, and it only works with the iPhone. In contrast, the Seek Thermal camera attachment costs only two hundred bucks and has a 206 x 156 pixel sensor, which is quite decent, insofar as thermal sensors go. And it works with Android phones, notably my Samsung S3. Better yet, much to my delight I found out that the device is actually manufactured in the United States. So I knew immediately what I wanted for Christmas. Okay, it arrived a little early, but that’s okay. It is a lovely little device, nicely packaged, looks very well manufactured, with a protective jewel case for safe storage when not in use.